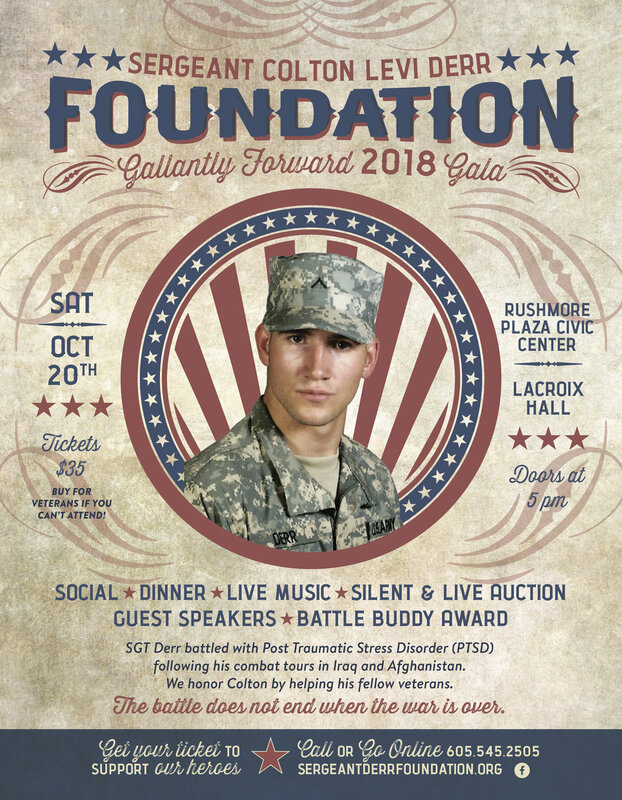 We invite you to our annual ‘Gallantly Forward Gala’ in support of Veterans on Saturday, 20 October 2018. Help us raise awareness about the issues facing our warriors: Post Traumatic Stress Disorder (PTSD), Traumatic Brain Injury (TBI), veteran suicide, homelessness, and the effects they have on veterans and their families who battle these demons. Veterans from the Black Hills area will be in attendance and your presence and community support will be met with much respect. The gala fundraiser will be held at The Rushmore Plaza Civic Center - LaCroix Hall, Rapid City, SD. Doors open at 5:00 p.m. with event ceremonies kicking off at 5:45 p.m. Tickets are $35 and must be purchased in advance. Business evening attire is recommended, but not required. The gala event which will feature a social hour, dinner, guest speakers, silent/live auction and live music. The event features two main speakers: First Sergeant Andrew MacVey, United States Army and former Sergeant John Thomas, United States Army. The Master of Ceremonies (MC) will be Dr. Julie Ertz and musical entertainment will be provided by The Starfellows - 2 brothers | 1 Piano. Founded in 2012, SCLDF is steadfast in our three-fold mission: Veteran advocacy, assistance, and public awareness of the battles our heroes face when they come home. If you can’t attend the event, we ask that you consider sponsoring a veteran in your stead or donate an item for the silent/live auction. All donations are tax-deductible and greatly appreciated. All of our staff volunteer their time; we have no employees. The SCLDF is proud to provide veterans with advocacy, resourcing, and outlets to problem-solving; financial assistance is just a part of what we offer to veterans and their families. Why do we advocate for our veterans? Present day soldiers are likely to face multiple deployments throughout their military careers. While on deployments, soldiers have an overall mission; soldiers feel united and develop a sense of duty and camaraderie. However, coming home does not always mean peace, but often reveals confusion, turmoil, anger, depression and isolation. An estimated 20+ veterans and 1 active duty soldier succumb to suicide every day. Sergeant Colton Levi Derr suffered with PTSD following his combat tours in Iraq and Afghanistan. In support of American’s War on Terror during Operation Iraqi Freedom and Operation Enduring freedom, SGT Derr, U.S. Army 1st Cavalry Division completed over 500 combat missions. Our hero succumbed to suicide on 28 APR 12 following his Afghanistan mission. We honor Colton by assisting his fellow veterans and their families and respectfully ask that you become involved in this battle. It’s imperative that the public and our veterans' families understand that coming home does not mean the war has ended; it’s our responsibility as a community to support our warriors and your assistance is greatly appreciated.